This yearly film festival features American and International films, shorts, documentaries, panels, tributes & more. Taking place in various downtown theaters, the 10 day event always draws a star studded crowd. Visit website for event times & ticket prices. An interactive & multicultural celebration of women’s accomplishments at the Earl Warren Showgrounds. Tickets start at $20. A visual delight, this festival showcases exotic & hybrid orchid species, art & photography, and workshops on orchid care at the Earl Warren Showgrounds. Tickets start at $10. More than 110 wineries and restaurants will take part in this years 32nd annual festival, sharing their current vintages and culinary creations in the lovely River View Park. Call for ticket prices. A classic county fair, where kids and adults can enjoy hot dogs and cotton candy in between riding the Ferris wheel, playing carnival games, and checking out food, craft & horticulture displays. Call for event times & ticket prices. The Community Environmental Council hosts the Earth Day Festival at Alameda Park in downtown Santa Barbara to help educate its attendees on how to lessen their carbon footprint. This annual Italian street painting festival brings together more than 150 artists to create vibrant original works of chalk art in front of the historic Santa Barbara Mission. A celebration of creativity and summer draw a crowd to this lively parade down State Street, followed by music, food & fun at Alameda Park. A showcase of premiere wineries and restaurants of the Central Coast at the Santa Barbara Museum of Natural History. Tickets start at $70. A perfect cap off to Independence Day festivities, catch the pyrotechnic display of lights at the Santa Barbara Harbor, starting at 9pm. This annual festival pays homage to Santa Barbara’s heritage with music, dance performances, parades, food & more! Festivities take place at the Santa Barbara Mission and throughout downtown. Visit website for event times & ticket prices. Bring the family out to Girsh Park in Goleta and sample lemon-inspired treats while enjoying the live music, arts & crafts, and pie eating contest. During the month of October, numerous events take place honoring our culinary community. Check out the website for more information on locations, times, and prices. This annual event brings together avocado lovers in downtown Carpinteria, where you can sample avocado flavored everything, from traditional guacamole, to the less traditional avocado ice cream. A celebration of commercial fishing, the harbor festival offers a variety of seafood favorites, from grilled albacore to steamed lobster. Kids can check out sea creatures up close in touch-tanks. Sample craft beers from over two dozen breweries and enjoy live music at Elings Park. All proceeds benefit local non-profits. Tickets start at $50. This festival features multiple events where you can hear up-and-coming artists, or learn from panel discussions on the evolution of the music industry. Visit website for event times & ticket prices. Located on the historic Stearns Wharf, the Ty Warner Sea Center was created to inspire a passion for the natural world. Visitors can participate in interactive exhibits, get up close and personal with live sea creatures, and learn about marine life in a fun and exciting way. The Santa Barbara zoo is home to over 500 animals on 30 ocean view acres. Visit their website for hours and ticket prices. 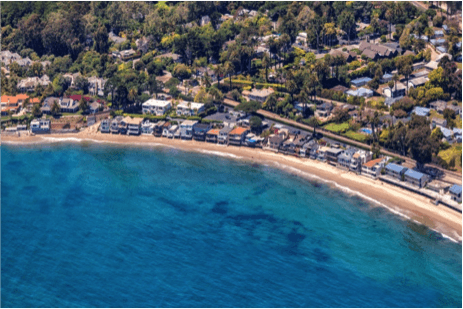 The history of Santa Barbara is tied to the sea, learn more about its maritime heritage with the museum’s many unique and interactive exhibits. Founded in 1941, the Santa Barbara Museum of Art has a number of permanent collections & also features rotating special exhibitions. Get a lay of the land from atop the historic Santa Barbara Courthouse, where you get a 360 degree view of the city, ocean & mountains. Take a trip through the Santa Barbara Channel where you can glimpse Gray, Blue & Humpbacks whales in their yearly migrations, as well as dolphins and seals. Visit website for reservations & to find out the best seasons for spotting whales. Explore sea caves via kayak where you get a unique perspective of the rugged island coastline and abundant marine life. Day & overnight trips are available. Visit website for pricing and tour dates. Through exhibitions, education, research, and publication, the Santa Barbara Historical Museum interprets over 500 years of history with collections from the Chumash, Mexican, Spanish, and American periods. Enjoy the vast array of informative exhibits featuring birds, insects, mammals, marine life, paleontology, and the Chumash Indians, a life-size 72-foot Blue Whale Skeleton, antique natural history art. Explore the Nature Trail along Mission Creek. Experience the wonder of space exploration in the Gladwin Planetarium. The Museum also owns and operates the Sea Center located on Stearns Wharf. 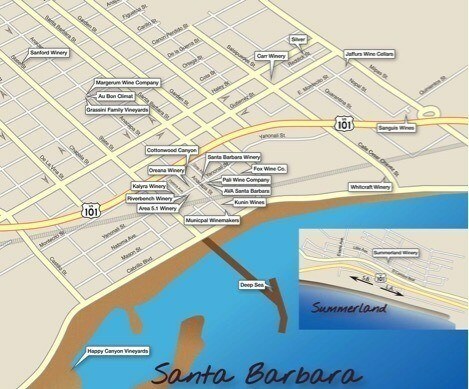 Santa Barbara’s downtown ‘Funk Zone’ is home to the Urban Wine Trail, where you can sample some of Santa Barbara County’s finest wines at 15 tasting rooms, all within walking distance. Carr specializes in limited production wines including Pinot Noir, Syrah, Pinot Gris and Cabernet Franc. Enjoy the ambiance of a working winery while sipping on delicious wines at the barrel top bar. Established in 1985, Whitcraft Winery has always been dedicated to non-interventionist wine making. Hand producing Old World style Pinot’s, Chardonnay’s, & Syrah’s from reputable AVA’s such as Santa Rita Hills, Anderson Valley, Santa Maria, & Ballard Canyon. Our boutique winery specializes in the handcrafted production of wines made exclusively from Bordeaux varietals grown on our estate vineyard in the Happy Canyon AVA of Santa Ynez. Kalyra has opened its second tasting room in downtown Santa Barbara. 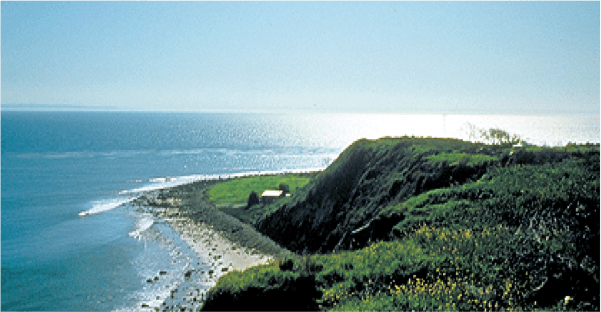 Mike and Martin Brown are pleased to offer wines from Santa Barbara Co. & beyond just two blocks from the beach. This modern tasting room features the wines of The Valley Project, an ongoing exploration of Santa Barbara County terriors. Taste small-batch wines from each of the region’s 5 AVAs, while checking out the epic hand-drawn chalk map of the county. Known for producing small lots of Rhône-style wines made with old-world sensibility from the Central Coast’s best vineyards. Varietals include Viognier, Syrah and Zinfandel, as well as blends. For nearly 25 years, Jim Clendenen, has made wines to reflect a distinctive style and approach to winemaking. Au Bon Climat wines are never made out of indifference - each wine is carefully handcrafted using grapes from the greatest vineyards in California's Central Coast region. Silver Wines produces both single vineyard designated wines and multi-varietal proprietary blends from Santa Barbara County grapes. The emphasis is on place, or terroir. Nebil “Bilo” Zarif founded Summerland Winery in 2002 with the goal of producing premium wines from expressive vineyard sources spanning from Santa Barbara to Monterey. Cottonwood Canyon Winery features “distinctively different age worthy wines”™, of estate grown Pinot Noir, Chardonnay and Syrah. Founded in 1962, the Santa Barbara Winery is the oldest winery in the county and has influenced the development of the Santa Ynez Valley as a world-class growing region. Jaffurs has been producing highly acclaimed Rhône varietal wines since 1994. Come tour and visit our downtown winemaking facility and tasting room. Riverbench Vineyard was established in 1973, when its first grapes were planted. Over time, Riverbench has become a prominent name for high quality Chardonnay, Pinot Noir, and Sparkling wines. After spending our formative years traveling and studying terroir and techniques, we are now working hard to make honest, interesting, and delicious wines for the people of this world. Since 1981 Sanford Winery has focused on producing distinctive, cool climate Chardonnay and Pinot Noir. With two vineyards in the heart of the Santa Rita Hills, our passion for grape growing and winemaking shows in every glass. Santa Barbara natives, Blair and Sarah Fox, created the Fox Wine Company with an emphasis on elegant Pinot Noir and Chardonnay and bold, flavorful Syrah. Come visit us in the Santa Barbara Art Foundry. Wines that are singular, compelling and beautiful rely on great vineyards and proper farming in union with a healthy dose of confidence, determination and style. What was once an old tire shop is now an eclectic winery & tasting room focused on Pinot Noir, Syrah, small batch reds and refreshing whites. Featuring live outdoor music on weekend days. Pali Wine Co. produces premium single-vineyard and AVA-specific Pinot Noir and Chardonnay from top vineyards along the West Coast. In addition to our passion for wine, we share a love of the arts, the wilderness and the ocean. We love our dogs, our vineyards and sharing our wine with others. Expect the unexpected with imaginative blends and unique varietals from the heart of Santa Barbara County and beyond. Take a break from normal and boldly go where no winery has gone before! Margerum Wine Company is committed to creating handcrafted small production wines. We strive make wines naturally that have individual characteristics and personality. One of the few west facing beaches in town, Butterfly Beach is a beautiful place to catch a sunset. Located near the Four Seasons Biltmore Hotel and the Coral Casino, this premier beach is a local favorite. Directions: Take Highway 101 to Olive Mill Rd exit and follow it toward the ocean. You can park along the street in front of the Biltmore. 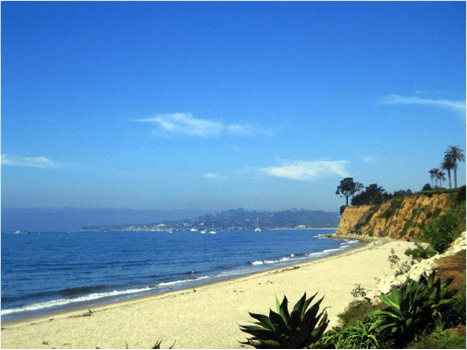 This easily accessible beach is a wonderful spot for families, and is convenient to Montecito’s Lower Village. Directions: Take Highway 101 to San Ysidro Rd exit and follow it toward the ocean. You can park at the small lot at the end of the road, or on the street. Tucked away down a short path, this lovely beach has a private feel and also offers a great reef break for surfers. Directions: Take Highway 101 to San Ysidro Rd exit and follow it toward the ocean. Park at the small lot at the end of the road, or on the street. Follow Hammond’s Meadow trail to the beach. 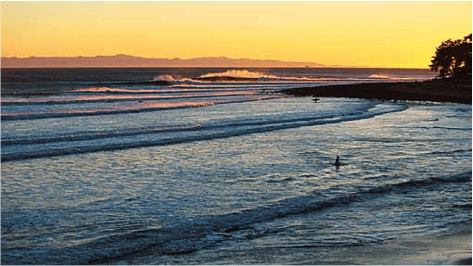 ‘The Queen of the Coast’, Rincon is a world class surf break and a great spot to enjoy long walks on the beach with sweeping views of the surf, islands & mountains. Directions: Take the 101 to the Bates Rd exit. Turn towards the ocean. When you get to South Via Real, turn right & park in the lot. This centrally located beach offers endless entertainment – from volleyball courts & long beach walks to the nearby restaurants & the Santa Barbara Zoo. Directions: Exit 101 at Cabrillo Blvd & park along street or in the city lot. 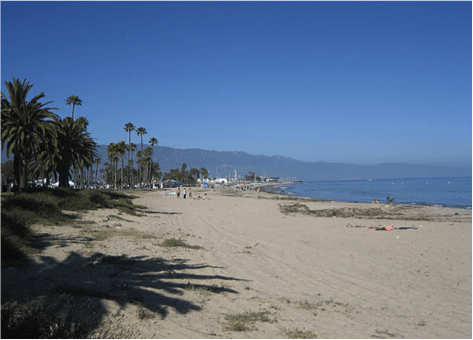 Located at Shoreline Park, Leadbetter Beach offers plenty of space for beach BBQs and gatherings and is home to a nice point break wave. Directions: From the 101 exit Garden St or Castillo St. Turn south towards the ocean, turn right on Cabrillo Blvd. After you have passed the harbor, Leadbetter will be on your left. Park in lot or on the street. 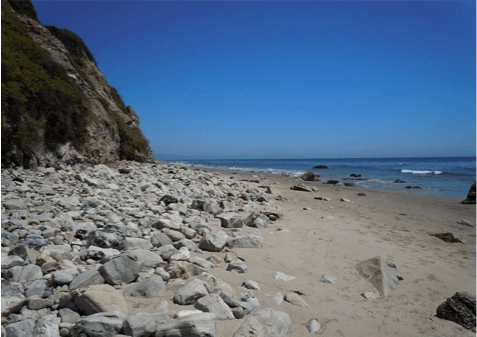 The ideal spot for a full day at the beach, Arroyo Burro, also known as Hendry’s, has picnic tables, showers & restrooms. When you get hungry, grab a bite at The Boathouse Restaurant. Directions: Take 101 to Los Positas exit. Turn away from the mountains. When you come to a T-intersection, turn right. Take the second left at the base of a cliff, park in the lot. 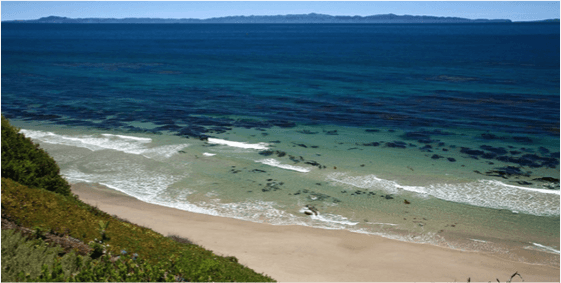 This private beach is exclusive to Hope Ranch residents and their guests. Showers & restrooms are available for guests, and during the summer lifeguards are on duty. Directions: Drive south on Las Palmas until you come to Las Olas Dr. You will come to a gate where you’ll need a card for access. This beautiful beach (& campground) is a short drive up the coast. 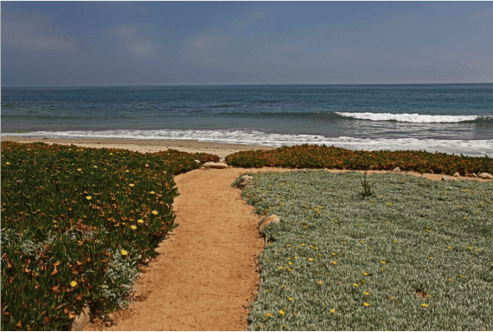 It features a great surf break, picnic tables, and showers & restrooms. Directions: Take the 101 N past Goleta and drive until you reach the El Capitan signs (about 10 miles). The road will take you right into the park. As it is a State Park, there is a $5 car fee.